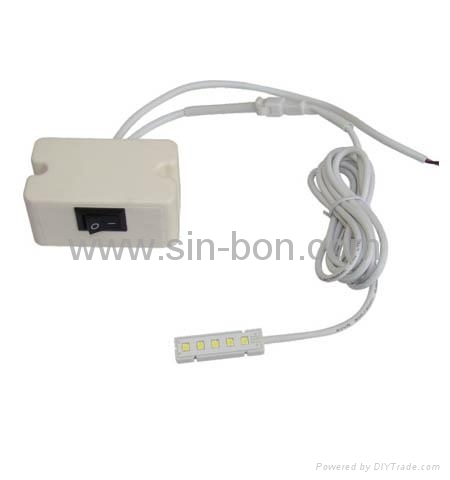 Protect eyesight: LED lamp for sewing machine can be fixed on the head of the machine,it can be adjusted by permanent magnet.lt can avoid the shadow or vision blind area brought from the traditional lighting,and reduce eye fatigue of long-time working to increase the rate of production. Improve working environment: Combine space lighting with spot lighting can improve the space environment and make the workshop brighter and more capacious. Using cool LED lighting source can decrease the environment temperature of the workshop, solve the problems such as space oppression created by traditional dense daylight lamps hanging around and the difficult moving of sewing machine. Energy-saving: Suppose a factory has 1000 sets of sewing machines, Electricity charge is RMB￥0.8/kwh,used LED lighting source can save about RMB￥14400 every year compared with normal energy-saving lamp. The average working life of LED lighting is more than 3 years while the normal energy-saving lamp is only one year. Long-term usage can greatly reduce the procurement costs.